Five Acres Off Fantastic Fun! Go-Karts! Rides! Arcades! Located just off International Drive Orlando, this popular and reasonable priced attraction contains one of the wackiest Go-kart tracks you've ever seen....its multi-level with tricky obstacles, corkscrews and a straightway track with some fantastic dips. Fun spot also houses a 100-foot-tall Ferris wheel, which is a great landmark for you to find, and with park hours to suit all ages, free admission and free car parking, this is a must-do place to visit. If it's a hot day and you're looking to cool down, head to the bumper boats, where you're sure to get drenched, and if you want to stay dry the traditional bumper cars are always a favorite. The Kid Spot area contains a number of kid-size rides and a huge arcade where you can enjoy unlimited play. 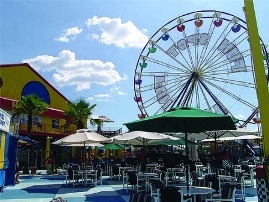 Remember Orlando Fun Spot Action Park does have a sister park in Kissimmee, aptly named Fun Spot U.S.A.
On the subject of prices take a look at our links below, you'll be impressed with the various offers, especially if you have a large family or group of friends. If you're looking for a real good bargain, try the Go Orlando Card: save 10% instantly on 2, 3, 5 & 7 day cards! We think Go Card is really good value because apart from Fun Spot Action Park, they also cover 39 other attractions throughout Orlando and Central Florida and when you weigh-up the overall entrance prices the Go Orlando Card makes perfect sense if you're budget minded! Take a look at the ad to your left for further details....its worth thinking about. Fun Spot Action Park might not be for everyone....Remember the location is around 20mins - 1hr from the Orlando/Kissimmee areas, so transport is required. If you're located on International Drive, you can use the I-Trolly check these links below for further information before you leave your hometown. I-Ride Trolly....Step off at stop #6 directly opposite Fun Spot. Excellent value for money. Opening times.....Here's a great calender to keep you updated through out the year! Prices...For All Tracks, Rides, & Attractions! Rides/Go-Karts....Fantastic selection for all ages! Forums...Peoples views and experiences about Fun Spot and around Orlando just choose a number 1, 2, 3, 4. When you're planning your trip to Fun Spot Action Park, you don't want to use old news and information. We will keep updating our site via our RSSfeed. Simply click onto the RSS feed above and follow the instructions. It's an easy way to stay on top of what's happening in & around Orlando, free of charge.